Managed Pressure Drilling (MPD) and Underbalanced Operations (UBO) are increasingly considered to improve production objectives. One of the challenges with drilling at or below the formation pressure are that unexpected gas influx events (kicks) can be more severe. In many current drilling operations, the intervention is left to the operator to adjust choke valve position, mud pump flow, weight on bit, rotation speed, equivalent circulating density (ECD), and other key drilling process parameters. Depending on the level of training and speed of response by the operator, process upsets such as pack-off or a severe kick may affect the overall drilling performance. 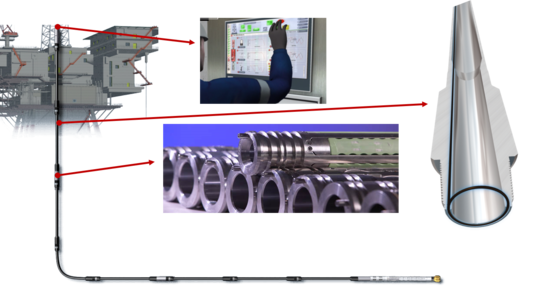 Recently, wired drillpipe is allowing unprecedented high speed communication to the bottom hole assembly (BHA) and at regular intervals along the drill string. Some of the available measurement include pressure, temperature, acceleration, angular velocity, and other parameters that can be used to monitor and predict disturbances such as unexpected gas influx or tailings pack-off. A high-speed stream of information does not always produce more desirable outcomes related to drilling performance. A decrease in performance may actually result if the driller is flooded with information or slow to synthesize that information into actionable results. The focus of our research in drilling automation is to synthesize high speed data into actionable information for a response by a driller or by an automatic controller in real-time. Towards the objective of fully automated drilling, intelligent systems are designed manage drilling parameters such as choke valve position, mud pump flow, weight on bit, and rotation speed to produce consistent and predictable results. Preliminary results show that this strategy is able to improve pressure regulation 1 and maximize rate of penetration 2. Advanced monitoring and control is performed with the APMonitor Optimization and Control for analyzing large-scale and complex systems such as the drilling process 3,4. 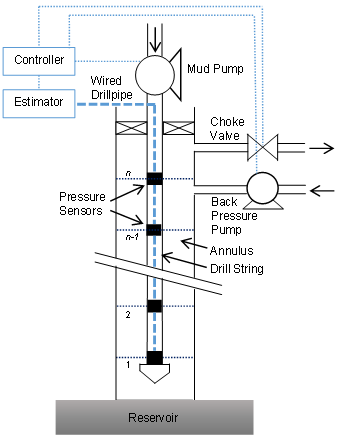 Eaton, A., Beal, L., Thorpe, S.D., Janis, E.H., Hubbell, C., Hedengren, J.D., Nybø, R., Aghito, M., El Boubsi, R., Braaksma, J., and van Og, G., Ensemble Model Predictive Control for Robust Automated Managed Pressure Drilling, SPE Annual Technical Conference and Exhibition (ATCE), SPE-174969-MS, Houston, TX: 28-30 Sept 2015.